Hello, friends! 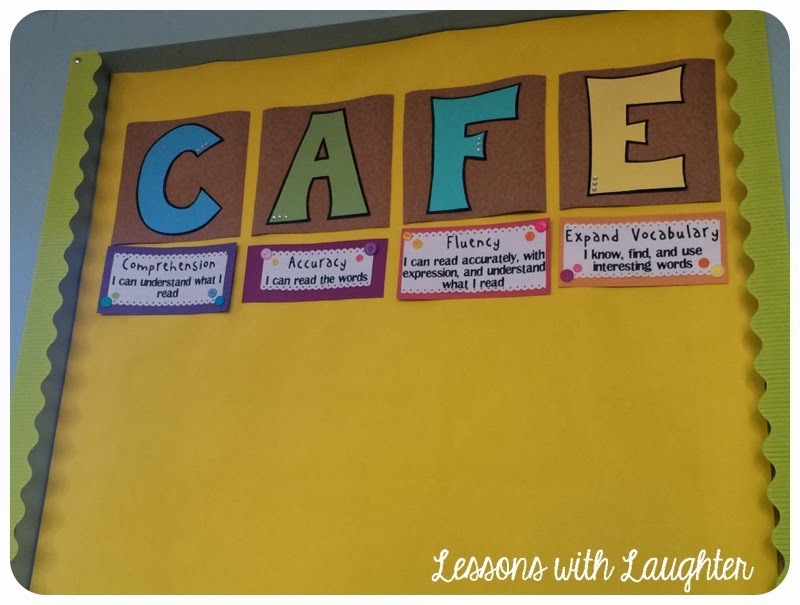 We have been working on our CAFE menu and I found an amazing resource to share that I didn’t even know existed! Here’s a picture of our CAFE wall sometime in the middle of last year. You can see that I have my students write down the strategies like the 2 sisters recommend. They love writing them down in fun marker colors and I think that it helps them remember and relate to them better since it is their writing! You can also see the star post-it notes on the bottom. I have my students write their name on a post it, and then after meeting with me and discussing what they need to work on to become a better reader, they move their post-it note under that heading. If you’ve read the book then this probably sounds familiar because that is where I got this idea from! I haven’t taken a picture of it with the strategies added yet, but hopefully you get the idea! I LOVE picture books and use them to teach a lot of standards in my classroom. There are so many amazing picture books for our bigger kids out there and they love them as much as I do! It is incredible! Each strategy has “Ready Reference Guide” that offers ideas of how to teach the strategy as well as why it is important for our students to learn. It even has a “troubleshooting” section for handling common misconceptions that students have. In addition to this guide, each strategy also has BOOKS that you can use to teach the strategy! A long list of them! There are videos too, but you have to have a membership to the site for those (which I don’t). 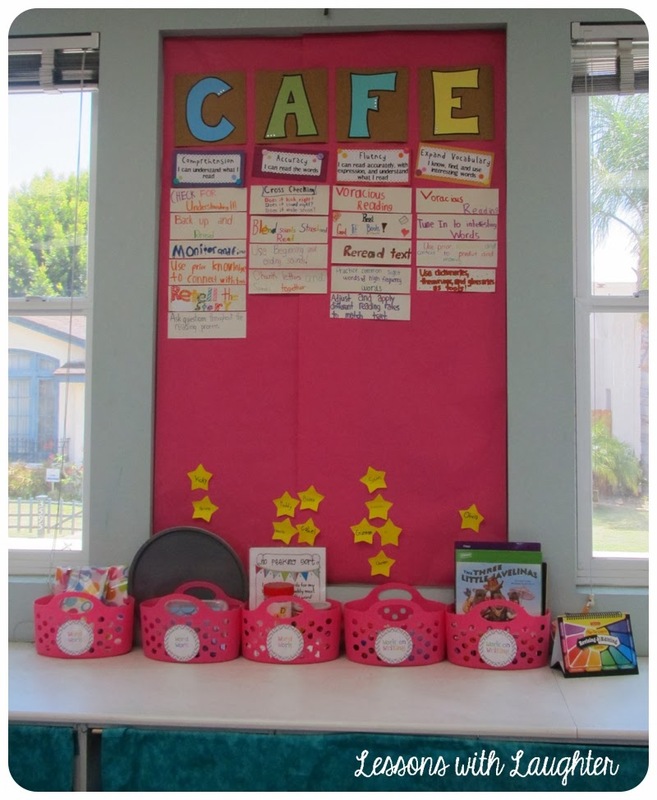 The interactive CAFE menu and book lists are all free! It is definitely a great resource that I know will save me a lot of time! The second technology resource I have to share is probably one of my favorite technology finds of the year! It is the site NewsELA and it is FREE! I first heard about it at SDCUE this November. It sounded amazing, but like all conferences, you come home with so many ideas, and it is hard to go back and research them all! Then, over break I found Catherine’s blog, The Brown-Bag Teacher. Her blog is one of my new favorites! She is absolutely amazing AND she is a first year teacher! When I saw her post on NewsELA I knew I had to go and check it out! I’m going to save a lot of the detailed explanation of the site since she pretty much says it all, but just so you know that you can’t pass up reading her posts, NewsELA is a news website that has lots of great articles about current events for students. The BEST part of the website is that students can change the reading level of each article! There are 4 different levels they can choose from on the right hand side (plus the maximum level… my kiddos aren’t there yet ) In addition, when they are done reading the article they can take a 4 question quiz that tests their comprehension and one of the common core anchor standards! I signed up all my students and then had them check out the website last week. They were all very impressed and engaged! And they were all working at their own level! We will be using them during our Daily 5 rotations, and my students and I can’t wait to make this a regular routine! Go check out Catherine’s post to see more of the features of NewsELA! Keeping my fingers crossed that I survive! oooo I had no idea about the CAFE tool, that is awesome!! I just started using Newsela after seeing it on Catherine's site and my students LOVE it. I can't get over how easy it is to differentiate. I hope your week is off to a lovely start Molly!